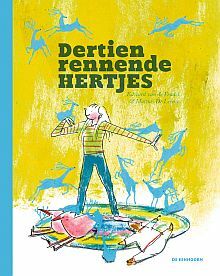 Illustrator Mattias De Leeuw and me made THIRTEEN RUNNING DEER (DERTIEN RENNENDE HERTJES). It was translated into German by Rolf Erdorf, was published by publishing house Gerstenberg and now the famous Deutsche Oper company in Berlin will make a music theatre performance out of it! There will be music by Händel, Purcell, Monteverdi and Hanusa, and there will be puppeteers. The play, which is called DAS GEHEIMNIS DER BLAUEN HIRSCHE ('The secret of the blue deer'), will premiere November 4. The book was originally published at De Eenhoorn. Rights - so far - were sold to Germany (Gerstenberg), China (Petrel), Taiwan (Interminds) and South-Korea (Lime). and for translation and production grants: the Dutch Translation Fund made a special on this book - here.